* Fixed bugs in TextBoxCur to prevent "wrap-around"
Help Manual Update for PopUp Forms. home, end key support to more cursor. Shift to select text. horizontal text scrolling. No vertical scroll or multi-line input. longer required. The example excutable code will now run "as is"
with no additional software installation. 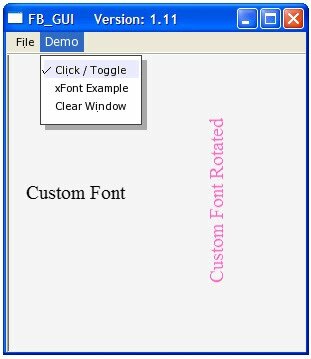 *Draw_Pop_Up modified so it no longer crashes if form title is null. 1) Added DrawString_Custom() so fonts from the Xfont library can be accessed on-the-fly at run-time. FB_GUI_HELP.CHM now much more complete. Many new examples, small programs included. 4) Another modification to Drop_Down_Menus to prevent problem with underlying controls. 5) Modified TxtBox Ctrl, so that setting Label_Len = -1 will suppress showing Label in the TxtBox as a prompt. 6) Moved TextBox_Process() into the Poll_Event() routine in FB_GUI_Lib and removed the reset for Active_Ctrl.Indx. Inserted Sleep into each loop that polls for user input to prevent CPU hog (thanks phishguy). 1) Added Slider with Scroll Bar and Arrow Buttons. 2) Modified Mssg_Box function to accept a single text string, as well as a text string array for multi-line. 3) Modified PullDown Menu code so screen store / restore is limited to the size of the pull-down menu. 5) Added many new simple example apps / program stubs to peruse. 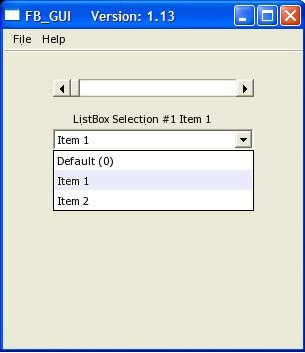 1 - Menu control modified so individual submenu items may be enabled/disabled. 2 - Much easier for user to code for Menu / SubMenu controls. See FB_GUI_HELP.CHM, which is still under construction but has a completed section on Menu / Submenu. 3 - Small icons can now be used as a prefix to a submenu item. This allows the user to place check mark or "X" to indicate an option selection or to show arrows (up/dn. lt/rt) as a hotkey. Last edited by BasicScience on Oct 30, 2011 3:39, edited 23 times in total. There's an error in the demo somewhere - when I run it I just get a blank window divided into three areas, but with none of the gui controls or the menu bar showing. The project was developed and tested with WinXP SP2 and SP3. Perhaps there are problems with other OS versions. As should be obvious, the code runs in Windows, but not Linux. Another common issue is that the program assumes Vera.TTF will be in the C:\windows\fonts\ folder. Finally, I've added a new update as of today. There are enhancements and some bug fixes... but I don't think these prior bugs would cause the problem you mention. Hmm.. it seems that for some reason I was missing vera.ttf in the fonts folder. found another copy and the demo is working now. Glad you got it to run. I have discovered yet one more small glitch in FB_GUI V1.05. The problem relates to adding controls to a PopUp Form. If the controls are defined as "static" (i.e. the index is defined at the program onset and remains fixed) then everything works fine. If you create "dynamic" controls that are added later as an increment to Num_PopUp_Temp_Ctrl then when the PopUp Form is launch the the control state is set to Disabled (just like all the other controls that are not on the PopUP). It was an easy fix that I will release with V1.06. Uhm, quick question. Though, I realize this is no simple task, but it would be nice to be able to use the return button to advance the line number in a textbox +1. I'm currently working on an editor which and your GUI seems best adapted to that. I've been looking through your text parsing routine on a simple way of doing this. I'm not familiar enough with your GUI to make significant changes to it at the moment, so some tips would be welcome. Also, does Box_Print allow for multiple files to be opened simultaneously? The TextBox control was designed to enable user input for a single text string that, in turn, would be assigned to single variable. As such, I didn't include detection of the ENTER key or CRLF in parsing the text string. 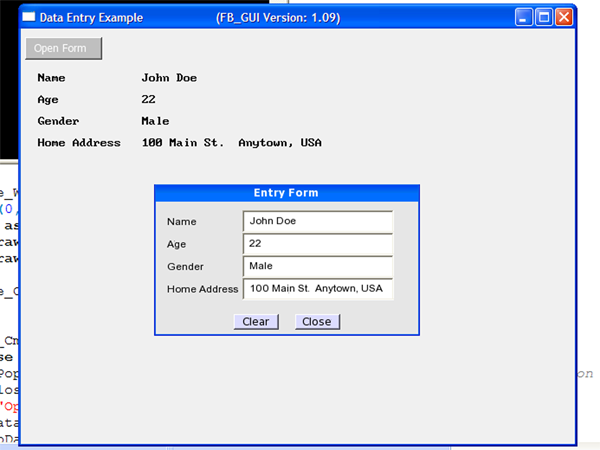 Moreover, like most forms that use TextBoxes for data entry, the TextBox control in FB_GUI, was designed to have the ENTER key terminate user entry, assign the TextBox input to the string variable, and shift the state of the TextBox from GotFocus/EnterData to Enabled but not selected. I would prefer to leave the TextBox control in this form. There is a convenient way to show multi-line text messages to the user in a pop-up window. See SUB HINT in the FG_GUI routines. The text string sent to HINT may contain CRLF. With regard to opening multiple files simultaneously, this can be done by using Ctrl_TxtFileBoX, but not with Box_Print (see the example in FB_GUI_Shell.BAS with the Show Txt File command button, which opens a second ASCII File while the file associated with Box_Print is open, too). One thing you might consider testing: How the gui would interact with something like a game loop. The gui seems to lose control if extra drawing/io subs are present in the main loop. I have tested the FB_GUI with mouse-driven cursors that display x,y values from plots, or that set limits for fairly complex nonlinear curve-fitting happening "live" with intensive recalculation / plotting of curves and the GUI did not get sluggish... even with about 30 active controls. As you have probably detected, the main loop polls by waiting for a ScreenEvent... which is pretty low-cost on the CPU. One of the features I like most about a home-grown GUI rather than using the WinAPI is that it's easy to control program flow by jumping out of the Main Loop that polls the controls. That way, the procedure or subroutine can perform I/O or graphics intensive tasks... and not be bogged down by continuing to poll for all the controls. My approach for having a fast, responsive subroutine is to (1) savevid to preserve the screen, (2) use sub Disable on all the controls on the main window, (3) branch to a subroutine that can have a new, smaller subset of controls and for which you can easily write a new loop to poll for events limited to the new controls, (4) upon exit, kill all the temporary controls, and use sub Enable to activate the controls from the original main page, (5) RestVid to restore the screen. Nice catch. You uncovered a bug in that whenever a drop_down menu overlapped a pre-existing control, then the mouse click triggered action by the pre-existing control... and not the menu selection. This has been fixed in FB_GUI V1.06 just released today. Other updates are listed below. I think that was the problem originally with my graphics as well. They were overlapping other controls. I'm going to tinker around with using the gui with an in game loop. I can see why no one wants to tackle this. You could modify FB_GUI_LIB.BAS to create a custom version of the TxtBox control that responds to ENTER with a new line, instead of closing focus on the TxtBox (as it now does). It would be involved, but not that difficult. Look in SUB TextBox_Process (). Test for d = CHR(13) as the event that indicates the ENTER key was hit. If so, then pad the string with the CRLF character (defined in FB_GUI.BI). Next, you will need to edit SUB Parse_Text to search the string for CRLF as well as spaces as it now does. See SUB Hint for an example of how to search for CRLF in the middle of a text string. If a CRLF is detected, then force a new Txt_SubStr(i). Finally, remove the d = CHR(13) test in SUB TextBox_Process() that causes branching out of the routine. The above approach would be more efficient than cracking into the TxtFileBox Ctrl (although this would be possible, too... and may be preferable if you want a file that contains a record of the keybd entries, or if the TxtString is really really really long). Many new changes since V1.04 posted in the forum.